Providing you the best range of diaphragm pump (ptfe) with effective & timely delivery. 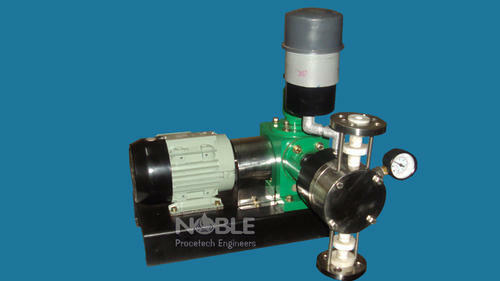 These pumps are used for transfer of flamable, Toxic and costly chemicals. These pumps are also called as glandless pumps. These are two types of pumps- single diaphragm & double diaphragm . The diaphragm is actuated hydraulically for suction and discharge. The diaphragm failure is indicated by pressure gauge / hooter. The flow / capacity is upto 5000 LPH and the discharge pressure is up to 70kg/cm2. The MOC is PTFE head with PTFE diaphragm, Metalic head with PTFE Diaphragm . It is manufactured as per API 675 Standard. It is also available with flameproof version. Area of application- Food, Pharmaceutical, Chemical, Petro chemical. Looking for “PTFE Diaphragm Pump”?